Attached to the inside collar is the Maska “AIR-KNIT” manufacturer’s tag reading “100% POLYESTER”. 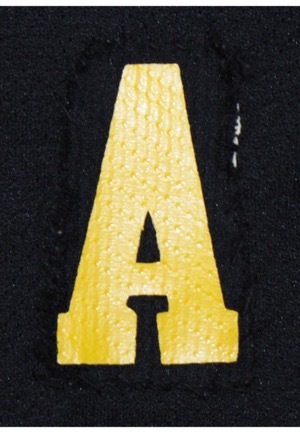 On the upper left chest is the assistant captains “A” patch in yellow vinyl lettering. The large “Penguin” team logo appears on front. 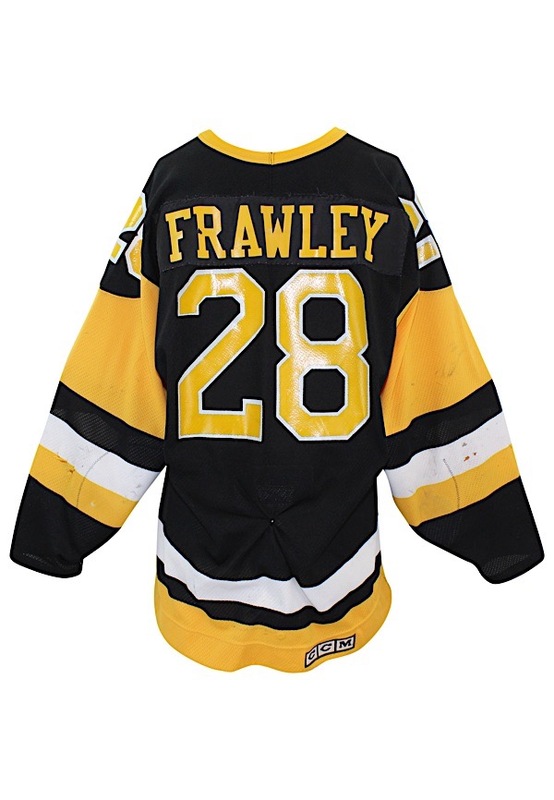 The player number “28” appears on the back and on both sleeves in yellow on white vinyl numbering. The player name “FRAWLEY” appears across the back on a black nylon nameplate in yellow vinyl lettering. On the back right tail is the “CCM” embroidered logo. The fight strap is intact. This jersey is properly tagged, was presented to us as game-used and in our opinion shows appropriate use.